C - Dr. Seuss' stories have rarely translated smoothly to the big or small screen, perhaps because the charms of his works are entwined with the medium itself. There's a particular pleasure to paging through a Seuss book, to following the predictable rhythms aloud, to lingering over the whimsical illustrations. The occasional successful Seuss adaptations—the 1942 Looney Tunes short "Horton Hatches the Egg" and MGM's How the Grinch Stole Christmas! from 1966—rest as much on terrific, witty character design and voice talent as on the strength of the source material. I'll resist discussing the recent, manifestly awful live-action adaptations of Grinch and The Cat and the Hat. 20th Century Fox's Blue Sky Studios—creators of the successful Ice Age films—returns to the Seussian well with a feature-length computer animated adaptation of Horton Hears a Who!. It's a successful, if forgettable, children's film that strikes closer to the distinctive Seuss appeal than any other attempt in recent decades. The plot should be familiar to most Americans under the age of fifty. Quite by happenstance, Horton the Elephant discovers a mote of dust that harbors an entire city, populated by minuscule people known as Whos. The story concerns Horton's efforts to convince other jungle animals of his discovery, and eventually to transport the Who world-speck to a relatively safe location. Meanwhile, the Mayor of Who-ville copes with the shocking revelation that a giant elephant holds his world in the tip of its trunk, and also with the calamities wrought by Horton's journey. The story is fairly thin gruel for a full-length feature, so the filmmakers necessarily bulk it up with wonderfully staged action set pieces (good) and mostly aimless characterization (bad). The visual design of Horton is remarkable. I'll resist dubbing it a triumph only because it rests firmly on Seuss' stylistic shoulders. The Jungle of Wool and Who-ville each have distinct looks, and both are delightfully rendered in three dazzling dimensions. Unlike the Looney Tunes and MGM efforts of previous decades, Blue Sky bestows Seuss' vision with volume and mass, a trickier task than merely adding motion to his fine artwork. The animators also make some appealing stylistic decisions of their own. Their take on the Seussian world—particularly its plants, animals, and Who-constructed features—has a charming, elastic quality to it. The characters seem made of sponge, rubber, and fluff, yet this toylike artificially adds to the film's visual magic. Loosed from the sweet simplicity of Seuss' black lines and solid colors, the filmmakers are free to play with texture and light in all sorts of engaging ways. The voice talent in Horton, meanwhile, is essentially colorless, although some of the secondary characters are smartly realized, if a little derivative. 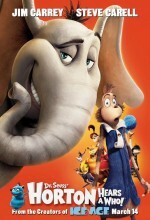 The only real misfire is Jim Carrey, who is poorly cast as Horton. Seuss' elephant necessitates a delicate blend of earnestness, naiveté, and miserable martyrdom. The performance falls short on all three points, although the animators pick up some of the slack, and Carrey fortunately shies away from his usual shtick. Horton is simply unmemorable, which is a serious misstep given that he is the story's hero. As the Mayor of Who-ville, Steve Carell adds a heftier dose of harried neuroticism to his usual screen persona, and manages to pull of the stronger lead performance. It's not top-tier voice acting by a long stretch, but Carell and the animators find the right groove for the story. Seuss' book is somewhat thematically muddled, and the filmmakers haven't done much to focus it here. At times Horton seems to be alternately pro-faith and pro-rationalism, pro-bigotry and pro-tolerance. Mostly the film coasts on the hazards of conformity and a squishy affection for living things. Parents on the prowl for positive Message Films for their kids won't find much in Horton that is affirmative, but neither is there anything to offend. The appeal of the film really lies in the ambitious maturity of its double story. Stripped down to its bones, Horton is a science-fiction tale plopped into a Sunday funnies setting. Its primary virtue might just be its insistence that kids can keep up with the complex, intercutting tale of two linked, parallel worlds. Horton mostly sidestep the sins that bedevil modern children's animated features—mostly. Wince-worthy pop culture references, cynical faux-hip-hop slang, and instances of scatological humor are blessedly rare. Nor are there many attempts at sly adult humor. Even when the film slips, it slips in a sublimely weird way. Take, for example, a baffling, throwaway Henry Kissinger reference, or an outrageous, seizure-inducing anime daydream that visits Horton. The film primarily sticks to the comedy basics, particularly old-fashioned slapstick and absurd wordplay from buffoonish characters. The visual pop and sophisticated story of Horton Hears a Who! raise it a head above the usual kiddie fare. It's no animated masterpiece, nor is it a definitive Seuss adaptation, but it's richer than ninety minutes of mere benign diversion. In a landscape of otherwise worthless children's films, parents can feel comfortable with this admirable entry.